Graeme Murphy is arguably this country’s greatest choreographer; certainly, he’s our most famous. He’s become an icon, which is always a dangerous position to be in. He’s undeniably central to dance in this country, and it’s certainly fitting that the Australian Ballet would mount a tribute show to the master. But the danger is that, seeing the work stripped of its context, the results become something of a memento mori. Murphy is a showcase in the traditional sense of the word: a glass box designed for us to peek in and look at dead things. Which is not to say they can’t be beautiful. The evening opens on the man himself, filmed and projected onto a massive screen. We get short glimpses of a variety of works, and the effect is to remind us of his breadth of experience, his extraordinary contribution to dance in this country. And then the show proper begins, with the prologue from The Silver Rose. Dimity Azoury dances the role of the Marschallin, an actor who fears her ageing and loss of looks, haunted by mirrors and terrified of losing her younger lover, Octavian, here danced by Ty King-Wall. It’s a rather prim and literal piece, and makes for an odd opening, but perhaps it expresses Murphy’s own fear of the loss of vitality. The excerpt which follows – from Air and Other Invisible Forces, one of Murphy’s great triumphs at Sydney Dance Company – is a far closer representation of his aesthetic. The sensual lyricism, those long extensions and languid pacing, often juts up with quicker, angular movements; a hand or foot will turn, punctuating phrases in unexpected ways. Combined with some glorious, billowing white cloth, the effect is sublime. Shéhérazade follows, a work from 1979 that shows it age a bit, but is still quite lovely. Mezzo soprano Victoria Lambourn sings Ravel’s score while a quartet of dancers play out an erotically charged routine, full of complex lifts and precise tableaux. A large section of Act I is taken up with excerpts from Murphy’s extended tribute to the piano, Grand. Scott Davie plays a rich variety of works from Beethoven to Gershwin, while being wheeled about the stage by the dancers. 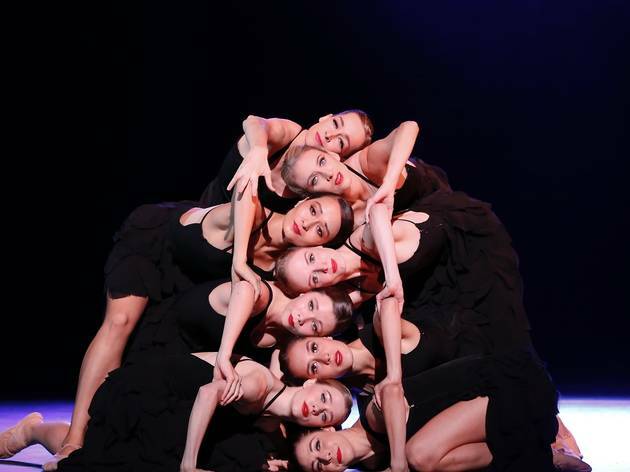 While many of these routines are gorgeous – some stunning group work from the female members of the corps, a superbly-danced divertissement to the music of Fats Waller – there’s a sense that this chopped up and shuffled selection represents a faintly compromised facsimile of the original. 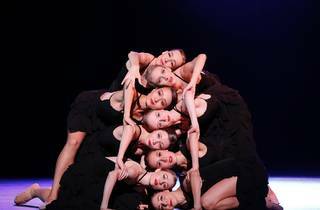 Act II has no such issues, because it’s the full ballet of Firebird, one of Murphy’s major works for Australian Ballet, first performed in 2009. An utter triumph for the Ballets Russes when it premiered in Paris in 1910, it’s a great and elemental work, and Murphy’s version taps directly into its primal power. Lana Jones dances the role of the firebird, and she’s brilliantly mercurial, capable of suggesting toughness and fragility at the same time. Kevin Jackson returns to the role he created in Ivan Tsarevich, and he’s terrific, noble and heartfelt. Amber Scott is lovely as the woman of his dreams, Tsarevna, and Brett Chynoweth makes a superbly reptilian Kostchei. The whole thing plays out as a dumb show version of The Tempest with no Prospero to impose order, and ends with a clever reference to a certain disastrous apple. Overall, Murphy proves a fairly convincing presentation of Murphy’s strengths as well as his weaknesses. We get an idea of his humour, which can become cutesy and trite when untethered to a sense of purpose. We get the complexity of movement, which is often breathtaking in group work but can become overly mannered in the pas de deux. We get some of his wonderful sense of drama and talent with mise-en-scène, and his lauded sensitivity to the individual personalities of his dancers. Tribute shows always feel slightly awkward, as if we were sending off an artist who isn’t yet dead, and this one is no different. It’s diverting, but nowhere near as exciting as a new work from this, our leading choreographer.